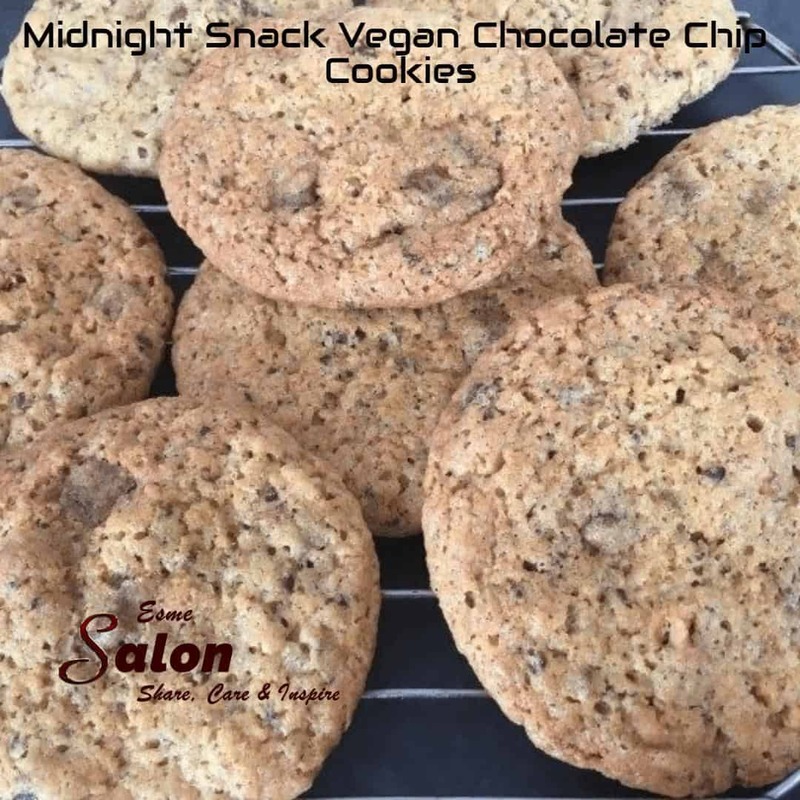 I love cookies, I could eat cookies for breakfast, lunch, supper, and even snacks, especially these Midnight Snack Vegan Chocolate Chip Cookies. My dad loves a cookie especially with him evening tea, my mum like me, doesn’t need an excuse to eat cookies and then there are of course my dads work buddies who love snacks during morning meetings. Nothing like a sugar high to start the workday. When my mum started her vegetarian journey, I was really under the impression that she would not be able to enjoy sweet things, her new lifestyle choice would be that of bland food that consisted of seeing how many ways one could use a potato or even 7days a week of soy products, but I was greatly mistaken. Now that I am aware of the great possibilities and endless food choices out there for her, I have made it my mission to incorporate my mum in all my planned meals. Including the tea snacks and this chocolate chip recipe is just up her street. When my dad tasted these beauties he was gobsmacked that they were eggless and vegan-friendly. They tasted so delicious and warm and it tasted like there was actually an egg in them. 1 cup chocolate chip pieces. In the bowl of your mixer, cream the margarine, both sugars, and the vanilla essence together, till light and creamy. Pop into a preheated oven and bake at 180C for 10 – 15 minutes, or until the tops of the cookies are lightly golden. Allow cooling for a couple of minutes on the cookie tray, before transferring to a cooling rack. An interesting recipe, Esme. It would have to be dark chocolate wouldn’t it? With no added milk. Yes for sure dark chocolate Robbie. I’m going to have to make these for the family with gluten-free flour, they look delicious!